You are here: Home / Marketing / What are you going to sell? According to the man with ‘a name to conjure with’, Igor Ansoff, you really only have four options when deciding what you are going to sell and to whom, and the surprising simplicity of these four options can be liberating when it comes to working out the details of your marketing and sales strategy. 1 You can sell more of the same to your existing or similar customers. 2 You can sell new products or services to your existing customer types. 3 You can sell the same products or services to different (new) types of customer. 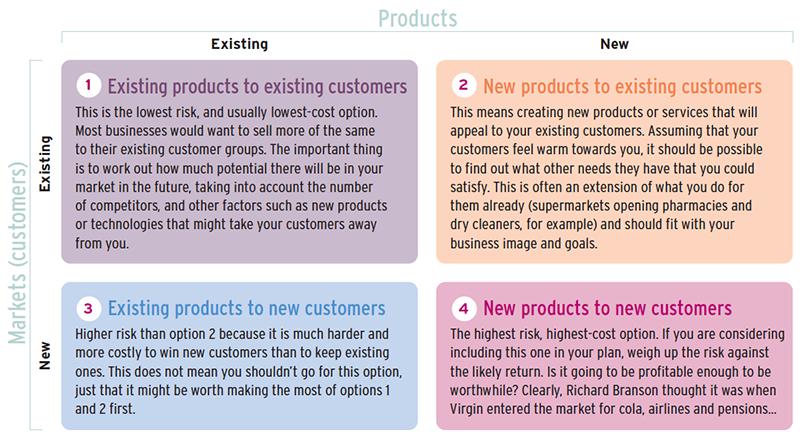 4 You can sell new products or services to different (new) types of customer. 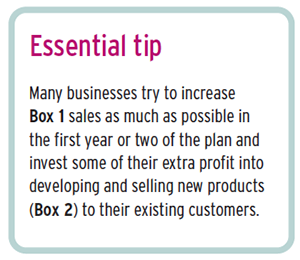 Reproduced from our Essential Business Guide. This is the lowest risk, and usually lowest-cost option. Most businesses would want to sell more of the same to their existing customer groups. The important thing is to work out how much potential there will be in your market in the future, taking into account the number of competitors, and other factors such as new products or technologies that might take your customers away from you. This means creating new products or services that will appeal to your existing customers. Assuming that your customers feel warm towards you, it should be possible to find out what other needs they have that you could satisfy. This is often an extension of what you do for them already (supermarkets opening pharmacies and dry cleaners, for example) and should fit with your business image and goals. Higher risk than option 2 because it is much harder and more costly to win new customers than to keep existing ones. This does not mean you shouldn’t go for this option, just that it might be worth making the most of options 1 and 2 first.